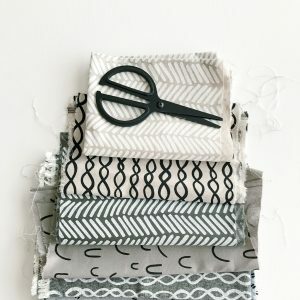 This blog post might come as a bit of shock… I’ve actually sewn something! The easiest, quickest no zip circle skirt ever. I literally can’t remember the last time I sewed something and actually finished it. My Make Nine progress is pathetic, that’s for sure! I’ve wanted to add a couple of skirts to my wardrobe for a while as I’ve been wearing a lot of skirts and t-shirts recently. I do love a circle skirt, so it was the obvious choice. 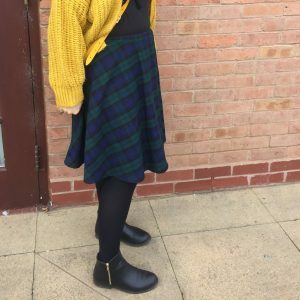 The tartan cotton fabric is from Minerva Crafts and chose the darkest colours I could to make sure that it would complement everything I wanted to wear with it. I definitely wanted this no zip circle skirt to have way more than 30 wears! Since I’ve been slowing down my sewing (and fabric consumption) it’s been important for me to use up the small amount that I had already. This meant that I didn’t have enough fabric for a skirt in my size, hence why I had to buy some. My original intention was to make a full circle skirt with a zip but, as always, I decided to go with the quickest and easiest way. I’m all about shortcuts. I used the By Hand London circle skirt calculator because I couldn’t for the life of me remember the maths needed to work out the size. I figured that a half circle would fit easily onto the fabric I’d bought without needing to sew up side seams. Yep, I’m that lazy. I took the morning to myself on Tuesday this week because my endometriosis was acting up again. Sewing seemed like a good distraction and way to relax for a bit instead. It’s very odd being able to do stuff like that in the daytime now that the girls are back at school. 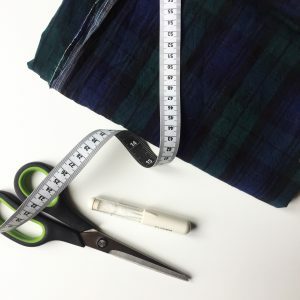 It’s ridiculously easy to sew a no zip circle skirt. I took my waist measurement as usual but added a couple of inches on before putting it into the calculator. This was so that I knew the skirt would pull up over my hips with no problems. I wanted my skirt to be just above my knees which worked out quite well. It meant that when I drew my skirt out on the fabric the skirt was one piece and I only needed to sew up the back seam. The waistband was just a long rectangle to fit the opening of the skirt and just slightly wider than my elastic. The sewing of this skirt was uneventful, thankfully. I sewed the back seam and used the overlocking stitch to finish the edges. Then I made a tube out of the rectangle for the waistband, leaving a gap to thread the elastic through. The waistband got sewn onto the skirt, elastic in and done! I’d usually leave a skirt to drop for 24 hours, but I only left this one for about 6. I really wanted to wear it yesterday for a networking meeting I was going to. When I came to hem it I thought I’d have another go using my rolled hem foot. I’ve come to the conclusion that I will never get the hang of using the damn thing, which is unfortunate as I was going to use it on my wedding dress. So anyway, rolled hem out the window, I just hemmed it as I usually would and it was all finished. Apologies for the lack of photos with this post. 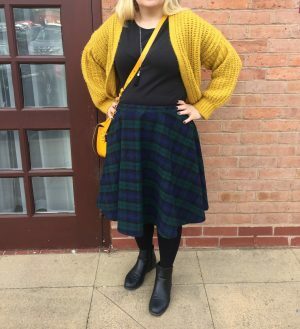 I only managed to grab a couple of photos as I left networking yesterday and now the skirt is in the wash!